You may have to indulge me a little, a squillion quilt pics in this blog post. This quilt is 'Take a Letter Miss G', a present for my sister's birthday- she has happily received it now so I can share it with you! My sister is a 'writer' in the same way that I am a 'sewer'. It is her creative outlet and she is good, award winning even! We are a creative family- my brother is a digital artist working in below the line advertising- it hasn't lead to riches but not bad for three state school kids. My sister's breakthrough poem was 'Imperial 58', inspired by our dad's vintage typewriter. The fabrics all relate to her- candy colours, lots of pink, text, typewriters, recipes, pretty things. The design was a simple tile quilt from Jane Brockett's The Gentle Art of Quilt Making. I made it as a quilt as you go project- that but did seem to take forever with an unforgivable amount of hand stitching- but worth it. The backing is a mix of Amy Butler's Organic soul blossom prints, very soft and silky plus random greens that fitted in. Aurifil 50/2 for piecing, quilting and hand sewing the binding. Hot pink is not a good colour for machine binding I found out! And a beautiful day on Sunday made for a great photo outing. Lula is crouched behind the quilt below, just making sure it doesn't fall into the stream. One special square for the top right, stamped with Versacraft ink. Thank you for the well wishes, I am just starting to get back to normal! This week I am using all spare time to complete my sister's birthday quilt- less than 6 days to get it done and it is a busy week. 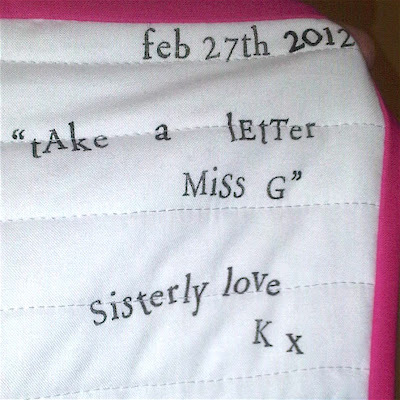 It is also my 2 year blog birthday on Friday and I have a little free pattern prepared for you, a sneak peek below! This is ending up being a bit of a lost week, I am under the weather so not much is happening here, sewing progress is slow and most of the time is spent unpicking mistakes- let's draw a veil over that and instead I would like to share the work of a couple of friends. Amy has great attention to detail in this pattern with notes on suitable fabrics and the most wonderful shaping that makes the skier jump out at you! Charise has the last month in 318 Patchwork Bee and she chose baskets. I restrained myself from making the sewing basket, I am designing a sewing basket block for Sew Out Loud quilt-a long so I went for knitting, just in case Charise feels she wishes to take up a new hobby. This is 6.5" with tricksy Y seams to make the handle at the top. I used my new favourite tiny ruler to add a generous 1/4 inch to my freezer paper pieces, the block is template style piecing rather than foundation. I do love the designs in this book, the simplicity and boldness of them is a constant reminder to me to keep it simple, less is more. The basket is made with Kumiko Fujita fabric, possibly my favourite all time text fabric as there are so many great words and motifs to fussy cut. The blue yarn is Suzuko Koseki fabric- currently available at Kit's shop The Happy Elephant on Etsy, an excellent source of text, Japanese fabrics and general loveliness. The needles were bias strips and the tops are buttons cut from a Kaufman print 'Vintage Couturier' all sewn on with needle turn applique. I used to be a ferocious knitter. When Lula was born I made her cardigans, hats, jumpers all from beautiful yarns. Moderation is not in my vocabulary, all or nothing and I did way too much! My hands and wrists can't take that any more and I sold all my knitting supplies a few years ago but I do love seeing yarn projects pop up over Flickr and Twitter and a small part of me aches just a little to be able to knit again. Now, back to completing a quilt, I am trying a quilt-as-you-go technique and will share next week. At the moment it is proving to be tedious but effective. Meanwhile the Sew Out Loud QAL starts tomorrow at Julianna's blog! Details of the final block competition can be found here- start preparing now, the judge is Suzuko Koseki, yes I know, I can't believe it either! there is a little more light in the day. This week I have been working on Swoon block 2 and I went for spring colours, fresh light prints. I used a mix of Amy Butler Soul Blossom voiles and Anna Maria Horner Little Folks. The cream is Kona Snow. I also bought a big A2 industrial cutting mat from Creative Grids. I was a little nervous buying this online, I had one very badly mailed in the past but this one arrived well packaged and is excellent quality! I also ordered the mini ruler you can see in the pic above, perfect for adding 1/4 seam to little pieces when freezer paper piecing. I cannot recommend Creative Grids rulers more highly, they grip the fabric so reduce slippage when you cut, easily my favourite rulers. Half term next week so a week off work, time for us all to get over colds, coughs and laze around. And whilst lazing, finish a quilt for my sister, make a dress for a wedding invitation and make a few bee blocks, plus a few other things to design and plan. In Cocorico Bee, Muriel chose Pippi Longstocking as her theme. She put a lot of inspiration into a gallery and initially I thought stripy tights and boots was the way to go, but I could not see it working with piecing, and you know I like to piece, I like the challenge. So instead I was drawn towards hair. I didn't want the desgin to be too tight, Pippi is a carefree character and I wanted to sew her in a improv free pieced style. I like the spirit I have captured in this, but it is reminding me a little of a rugby ball! This is how the process went. First I sketch the basic shape on to quilt block graph paper and tidy up the lines. Then I use permanent fine liner and label the sections, add some tick lines for matching up. I trace this onto the reverse shiny side of freezer paper with pencil. I use reverse tracing so that the freezer paper sticks to the back of the fabrics, easier when piecing. I free pieced the hair in two halves and two plaits and then cut it to shape using the freezer paper. Then it is all pieced together. The tick lines help a lot when sewing the curves and but I also just have to wing it some of the time. This was a kicking and screaming block, I had to drag it into existence out from wherever it was hiding. I could not see it until I was well into the construction and I was prepared that I might have to abandon it and start something else. The jumper is based on Pippi's jumper, Muriel managed to find one for herself! To tell the truth I am more than a little relieved that I managed to finish this, I was getting an imagination funk on what to do for this block. Off you go Pippi! A skirt to compensate for last week's disaster, another Ginger, pattern by Colette, pockets by me. I liked these pockets but didn't want binding, just a simple pocket, lining, joined at the side and bottom, top stitch details and stitched in to the skirt side seams and waistband. I drafted a shape using the skirt pattern as guidance and made a tester before making the real thing. The fabric is the uber soft wale corduroy by Amy Butler, Soul Blossoms 'English Garden' in Bluestone I bought mine from Julia at Gone to Earth. Highly strokeable. I lined it with a cheap thin cotton, corduroy has a tendency to bag out, espcially around the booty and if I am going to all the bother of making a skirt for myself I like the extra touches like lining and natural fibres and pockets big enough to have purpose. I made this a size up from my last- size 6 in the Colette sizing. I don't like tightness or restriction, and this is perfect, no gaping but just a little wriggle room. I sewed the waistband facing just a little further away, about 1/8" from the invisible zipper stitching line- if you have made Ginger you will know what I mean-this zip slides up beautifully. I do love the shaping on this pattern, the pattern pieces slope in at the back to allow for the small of the back, and also a little at the front to allow for a little belly! It is A line with added A, very clever simple design. Maybe you are new to paper piecing and want a bit of help, support and community as you find your way around the different techniques, there are a couple of Quilt-a-longs coming up. the code can be found along with all the other starting info at Kirie's blog and also at Julianna's blog. There are great prizes and a design competition for the 12th block- as for the judge, it will take your breath away but I am sworn to secrecy! Flickr group is hereLooking for something at beginner level? Bought a copy of Fat Quarterly 8 Paper Piecing Issue? Dolores at A Labour of Love is planning a sew-a-long using the projects from the ezine! The idea is that you can support each other through the different techniques. And, thinking ahead now, I will be at the Fat Quarterly Retreat in June teaching a class or two. I will be doing a technique class on paper piecing using the freezer paper template technique but with a twist-it will be hand sewing, no machine needed. This will include stitching an inset Y seam- if you can learn it by hand it will be a breeze by machine! And if you can't wait for more help, check my pages link on paper piecing resources!